With the hit and miss fence panels, your compound and that of your neighbour will enjoy a spruced up look on both sides. Hit and miss design entails vertical and overlapping timber that are fixed together for durability and aesthetic purposes. The end result is a fence that blends well with the existing garden features. At Sheds to Last, we provide hit and miss fence designs that are attractive and appealing. 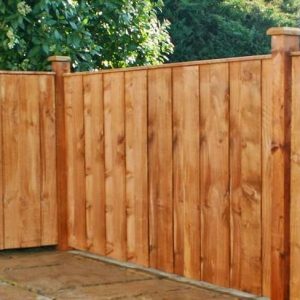 We only use certified timber to ensure that we provide you with fence services many years. With hit and miss fence panels from our depot, you get a variety of panel lengths to suit your tastes and preference. You can choose short, medium and tall heights according to the fencing project in hand. You don’t have to worry about wind loads, our vertical fence panels are created to withstand and reduce wind loads up to 15%. The pressure treated wood used for these panels offer a 10 year guarantee. What’s more, you will get matching gates to complete the awesome look from outside. When you choose hit and miss panels from Sheds to Last, you enjoy handcrafted timber products. These panels are produced in a workshop with precision. You get to enjoy panels that come with flat, bow or concave tips.. We never delay your order and we will confirm right away when we will make the delivery. To get a better overview of our hit and miss fence panels, check our website or you can talk to our representatives. The good thing about hit and miss fence panels from Sheds to Last is that they are low maintenance. You don’t have to worry about the weather. We can offer advice on how to maintain them.